The clear melodious peep of this sand-colored sandpiper gives it its popular and scientific name. The Piping Plover breeds on sandy beaches or rocky shores on the Atlantic coast from Eastern Canada to North Carolina, on the shores of the Great Lakes, and along rivers and wetlands of the northern Great Plains. Unfortunately, due disturbance by people, dogs, vehicles, and destruction of breeding habitat for development or water control structures, their numbers have declined to such an extent that the Atlantic population has been declared Threatened and the inland population Endangered by the U.S. Federal Government. In winter, most individuals are found on coastal beaches, sandflats, and mudflats from the Carolinas to the Yucatan. 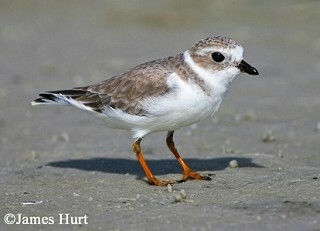 In Tennessee, the Piping Plover is a rare migrant typically found from mid-July through early September. Description: This stocky shorebird has sand-colored upperparts, white underparts, and orange legs. During the breeding season, adults have a black forehead, a black breast band, and a stout orange bill; during the winter the breast band is sand-colored, and the bill is dark. Voice: Clear, mellow whistles peeo, peeto, peeplo. Semipalmated Plover has a dark brown back, a thicker, more complete breast band, and a dark face patch. Killdeer is larger, darker-backed, and has two distinct breast bands. Habitat: Open sandy beaches, occasionally large open mud flats. Diet: Insects and small aquatic invertebrates. Nesting and reproduction: The Piping Plover has not been documented nesting in Tennessee. Status in Tennessee: Very rare migrant across Tennessee with more records from the western part of the state. Spring records are fewer, but are mostly from late April to the first week of May. The more numerous fall records are mostly from mid-July to early September. In 2009, 5 individuals were recorded across the state, which was an exceptionally high number for one year. In April 2011, two birds were found on "Snow Bunting" peninsula on Old Hickory Lake. One bird had been banded 10 years early in Saskatchewan. The Piping Plover is a federally endangered species with approximately 2500 breeding pairs remaining in the world. Best places to see in Tennessee: This species is not found anywhere with regularity: Island 13 in Lake Co., along the Mississippi River, and Gallatin Steam Plant in Sumner Co. are a few locations with recent records. Haig, S. M. 1992. Piping Plover (Charadrius melodus). The Birds of North America. No.2 (A. Poole, P.Stettenheim, and F. Gill, Eds.). Philadelphia:The Academy of Natural Sciences; Washington, DC: The American Ornithologists' Union.